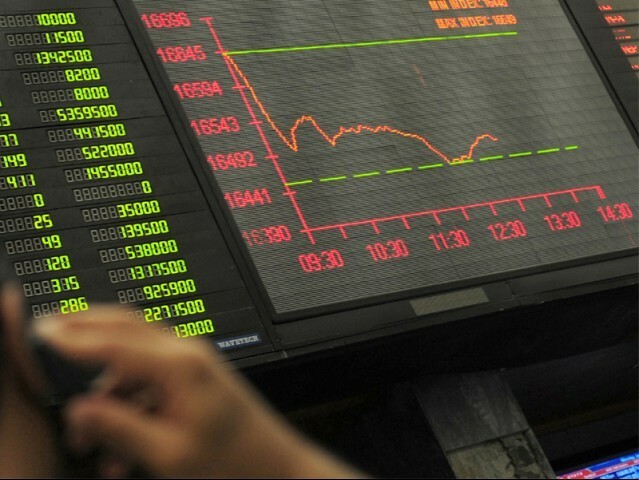 The Karachi Stock Exchange 100-Index on Monday underwent correction for a second consecutive session, shedding 325 points on profit-taking across the board, dealers said. Aqeel Karim Dhedhi, chairman of AKD Group said foreign selling was witnessed in the market during the working session last week, which triggered local selling as well.�Local profit-taking is part of the cause of the decline in the market,� he said, adding that the market would improve on the whole if there is some more correction in the coming sessions. The KSE-100 Index fell by 325.18 points or 1.44 percent to 22,216.46 points against 22,541.64 points recorded in the last session. The index reached its highest level during intra-day trading at 22,605.52 points while the lowest level of the day was recorded at 22,190.75 points. KSE-30 Index also declined by 296.81 points or 1.69 percent to 17,289.56 points during Monday�s session against 17,586.37 points recorded in the last session. Trading was mostly recorded in second and third tier stocks while cement remained the dominant sector. Fauji Cement, Bank of Punjab-Right, Lafarge Pak and BankIslami Pakistan remained in limelight of third and second tier stocks. Of a total of 357 active companies in the session, 126 ended in green, 214 in red while 17 remained unchanged. Along with the index, turnover, value and market capital also declined in the market. Turnover fell by 111 million shares to 377.77 million shares from 488.48 million shares, trading value declined to Rs8.31 billion against Rs13.26 billion while market capital reduced to Rs5.38 trillion against Rs5.45 trillion recorded in the last session. Zafar Moti, analyst and senior KSE member, said institutional selling was witnessed in big stocks, while profit-taking was witnessed in blue-chip stocks. �Correction is on and big players are checking the health of market,� he said, adding that more correction is likely in the coming session but the market would go up again with healthy signs. Haji Ghani Haji Osman, former KSE director, said profit-taking was witnessed in mostly oil and energy stocks whose prices were high, adding that the market is likely to remain steady in the coming days. Ahsan Mehanti, an analyst at Arif Habib Corp, said profit-taking was witnessed in stocks across the board due to limited foreign interest and local investors, who have adopted a wait and see policy on the government�s dealings on the circular debt issue. �Concerns about a gas shortage for textile and fertilizer sectors and unrest in the city has played a role in the bearish sentiments at the KSE,� Mehanti said.Samar Iqbal, a senior manager equity sales at Topline Securities (Pvt) Ltd said foreign selling on Friday kept market participants skeptical and continued selling in oil stocks dragged market 325 points down. �Heavy weight Oil and Gas Development Company Limited and MCB remained the major contributor in the downfall while cement stocks also witnessed profit-taking,� she said. Fahad Ali, an analyst at JS Global, said the week opened on a bearish note continuing its trend from last week whereas KSE-100 fluctuated between the green and red zone in the first hour of the trading session. �Local investors preferred to square of their positions in the market in anticipation of the sell off to be continued by foreign investors,� he said. Textile, oil and energy and cement sectors remained under pressure. Positive interest was seen in the banking sector where expectations are that the minimum deposit rate will be revised downwards. �We expect the market to remain volatile where position in banks, oil and textile sectors should take a dip,� he said. The highest increase was recorded in shares of Wyeth Pak Ltd, which rose by Rs77.50 to Rs1,642.00 per share, followed by Sanofi-Aventis that improved by Rs24.14 to Rs506.97 per share. Major decline was noted in shares of Unilever Food, which fell by Rs238.00 to Rs4,762.00 per share, followed by Colgate Palmolive that declined by Rs94.00 to Rs1,795.00 per share. Significant turnover was recorded in stocks of Bank of Punjab (Right), Maple Leaf Cement, Fauji Cement, Bank of Punjab, Lafarge Pak, Nimir Ind Chemicals, Bank Al-Falah, BankIslami Pakistan, Pakistan Telecommunication Company Limited and Jahangir Siddiqui Co.
Bank of Punjab (Right) remained the volume leader with 112.23 million shares with increase of 89 paisas to Rs3.78 per share; it was followed by Maple Leaf Cement with 24.84 million shares with decline of 50 paisas to Rs24.20 per share. Fauji Cement remained third leading stock with 24.35 million shares and a decline of 29 paisas to Rs13.07 per share, Bank of Punjab with 18.03 million shares and an increase of 63 paisas to Rs14.74 per share, Lafarge Pak�s with 16.08 million shares and a decline of eight paisas to Rs9.07 per share, Nimir Ind Chemicals recorded trading of 15.42 million shares with an improvement of 17 paisas to Rs4.76 per share, Bank Al-Falah with 10.59 million shares and an increase of 36 paisas to Rs18.94 per share, BankIslami Pakistan�s 9.02 million shares were traded with a decline of 45 paisas to Rs6.44 per share, PTCL with 8.87 million and a decline of 68 paisas to Rs22.24 per share and 8.83 million shares of Jahangir Siddiqui Co were traded with increase of two paisas to Rs14.13 per share. Shares turnover in the futures market fell to 16.45 million shares from 29.33 million shares traded in the previous session. Fauji Cement Company Limited June futures led the market with 4.21 million shares and a decline of 22 paisas to Rs13.19 per share, followed by DG Khan Cement June futures with 1.91 million shares and a decline of 47 paisas to Rs86.48 per share. Out of 126 companies� shares traded in the future market, 17 advanced, share price of 108 companies declined while one remained unchanged.